It’s based on the same hip-tucked body shape as my keyhole neck kimono/magyar blouse and like that one also has a 30’s/40’s feel to it. Works with or without shoulder pads as well. Yesterday as an after thought I added optional extra front and centre back tucks to this pattern to help you make the hips a closer fit if desired. Top-stitching along each tuck looks nice too. 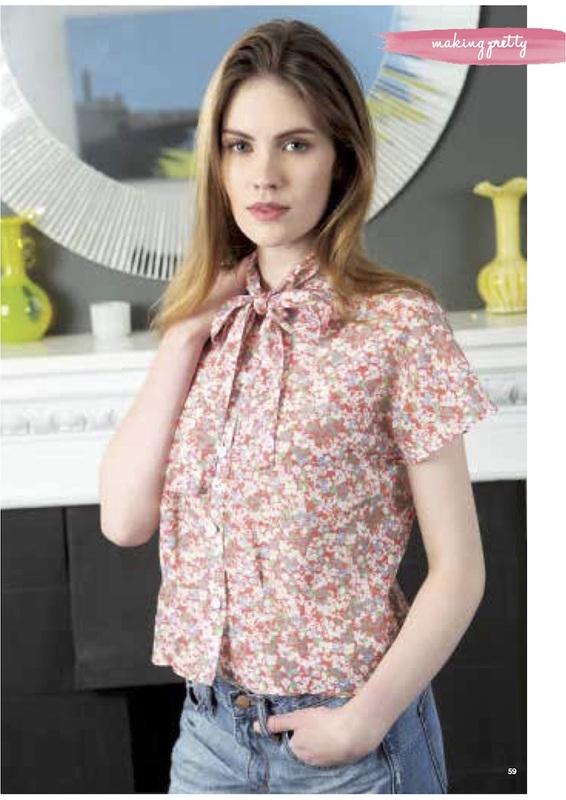 ….you could add a different sort of collar; a less fluffy bow tie, a peter pan, a simple stand or even just sew on a vintage lace collar to the round neck. 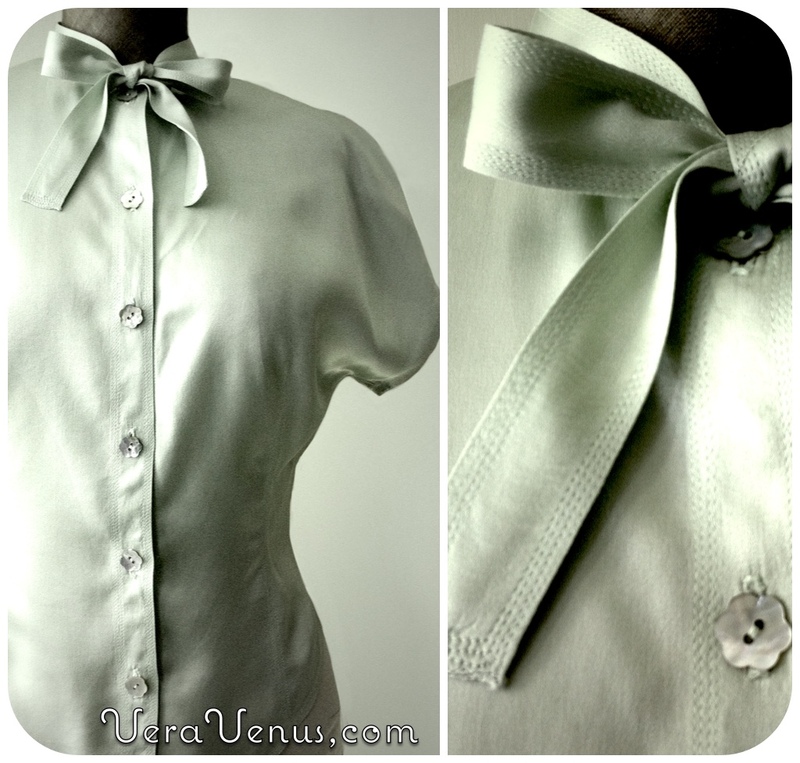 This little green silk satin blouse is one I made years ago. It has a very similar style armhole though shaped closer to the shoulder and with a little curve in the underarm so it forms a closer fitting grown-on cap sleeve. The simple skinny tie collar is just a straight folded band. A detail I particularly like from 30’s and 40’s bloused is multiple close rows of top stitching. It lends an instant vintage feel to a modern make. I went to town with that idea, even adding it on at the seams and hems. 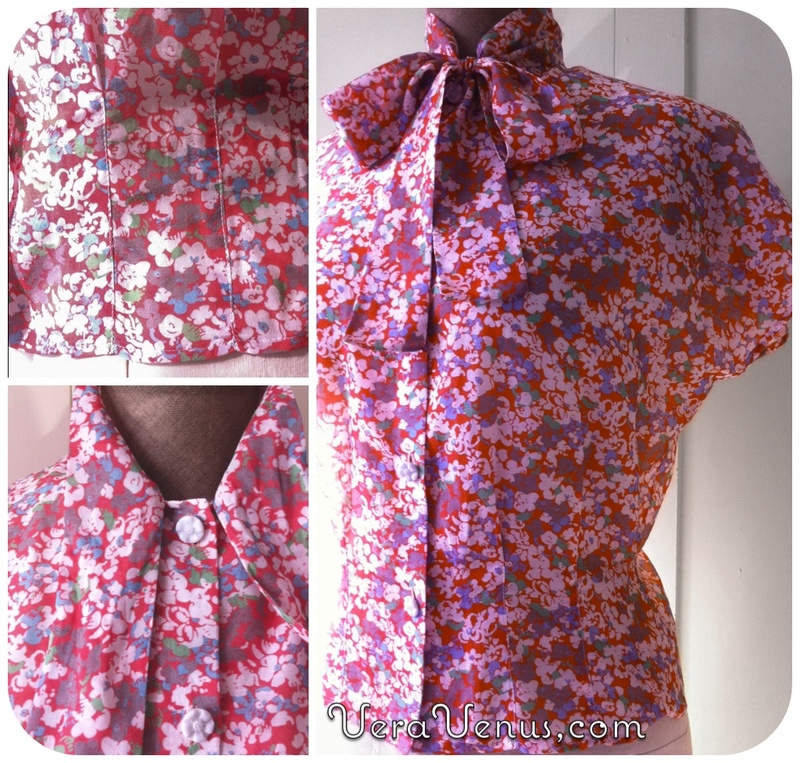 I like the bow blouse with jeans but it works really well with some of of my vintage 40’s suits. I’ve just been sorting through my Spring/Summer wear (inspired by this sunny day) and remembered that a few of those of those have undergone some major alterations to get them to fit me nicely. A post on what I think of as ‘kamikaze alterations’ is on the way. It may give you some useful ideas on how to approach various fitting alterations on vintage garments, particularly how to gain that valuable waist and bust real estate. It’s more than just letting out a couple of darts as you will see. Hi. Thanks so much for sharing your work. This blouse looks lovely. I have been sewing for a very long time, but I am not professional and I always find that I am critical of the end product. I do have questions on how to serge edges and roll edges. I notice this is size S/M and I am wondering if I could size it for L without difficulty. Again, thanking you from Boston, Mass. Thank you for answering my e-mail so quickly. I found the information very helpful and am eager to start applying this new knowledge. Oh goodness, I want to make this, and make a cute pencil skirt yo go along with it!! Carla, and there is a draft your own pencil skirt (and other skirts) tutorial on my free pattern page…just in case you haven’t seen it. Great pattern. I can see this with a great high waisted circle skirt. I just love making vintage clothes. Would love to add your blouse to my collection. That sounds like a great look paired with a circle skirt! Love the pattern. Here in Australia we have on the cable TV a show called The great Bristish sewing show. Its really great and they made tops from the 30s the other week. It had Peter Pan collars with elastic gathering under the collars. I would love to make that blouse if you have a pattern. I do compulsively watch the Great British Sewing Bee on BBC catch-up while I’m in my workroom but I must say for soooo many reasons I don’t actually like it much. My family thinks it’s a hoot to hear me talking at my computer ‘mad woman in the attic’ style while it’s on, it doesn’t bring out the best in me! But yes, a pretty blouse. Anyway a quick look on Google seems to indicate that after the series a book and patterns from the series are released. Maybe the book will have that blouse?